Technology helps of course, so we’ve invested heavily in some big gadgets like our MARCO TrackIT, a full traceability system that keeps our quality and consistency high by recording our recipes, ingredients, at every critical control point. All of our produce at Beacon Foods HQ is bar-coded, so we can check up on any product at any time. We make sure that all of our ingredients are accounted for. Our factory is divided into high care, high-risk and low-risk areas. High-risk areas use positive release equipment, with a bio-trace monitoring system. We continually carry out rigorous micro tests. 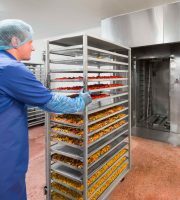 Our quality control team also conduct organoleptic panels to make sure all of our produce is looking, tasting and smelling great. We carry out in-depth factory trials formulating detailed quality standards at the start and end of life. We’ve also been certified BRC Grade AA and awarded an Organic Farmers and Grower Certificate. At Beacon Foods, consistency is key – so we can get it right for you first time, every time. We have over 500 fully accredited growers supplying our high quality fruit and vegetables throughout the year. When it comes to adding value, we’re on it every step of the way! In simple terms we take the best fruit and vegetables, herbs and spices, beans and pulses and make amazingly tasty stuff with them. Need single portions? Unusual batch sizes? We’re happy to help. 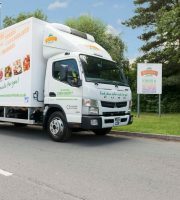 Our dedicated fleet of temperature-controlled lorries travel across the whole of the UK.